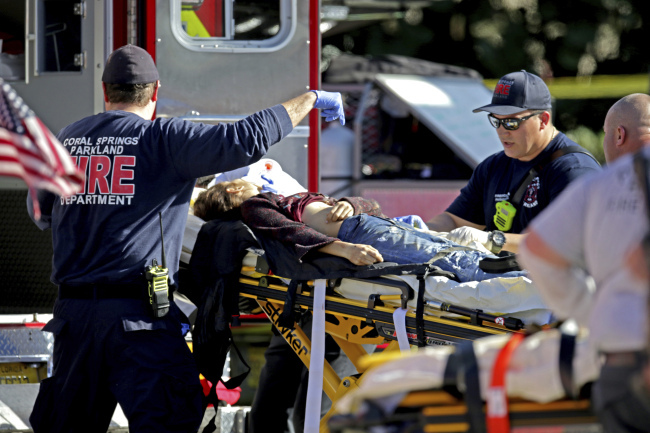 PARKLAND, US (AFP) - A former student armed with an AR-15 rifle opened fire at a Florida high school on Wednesday, killing at least 17 people, officials said, in a harrowing shooting spree that saw terrified students hiding in closets and under desks as they texted for help. “We have already begun to dissect his websites and things on social media that he was on and some of the things... are very, very disturbing,” Israel said. Israel said he was uncertain about the exact number of people injured, but at least 14 were taken to hospital and two had died there of their wounds. Television images showed students, some with their hands in the air, being led out of the school by heavily armed police officers and an armored vehicle filled with a SWAT team on the scene. “The alarm went off so we had to evacuate from our classes,” she said. ”We were in there for probably 40 minutes. We were locked in the closet until SWAT came and got us,“ she told CNN. President Donald Trump offered his ”prayers and condolences to the families of the victims. Since January 2013, there have been at least 291 school shootings across the country -- an average of about one school shooting a week, according to Everytown for Gun Safety, a non-profit group that advocates for gun control.